RATCHET & CLANK work to save the Solana Galaxy in their all new movie opening April 29, 2016! Based on the iconic PlayStation video game, these two unlikely heroes struggle to stop a vile alien named Chairman Drek from destroying every planet in the Solana Galaxy. Ratchet is the last of his kind, a foolhardy “lombax” who has grown up alone on a backwater planet with no family of his own. Clank is a pint-sized robot with more brains than brawn. When the two stumble upon a dangerous weapon capable of destroying entire planets, they must join forces with a team of colorful heroes called The Galactic Rangers in order to save the galaxy. Along the way, they will learn about heroism, friendship, and the importance of discovering one’s own identity. 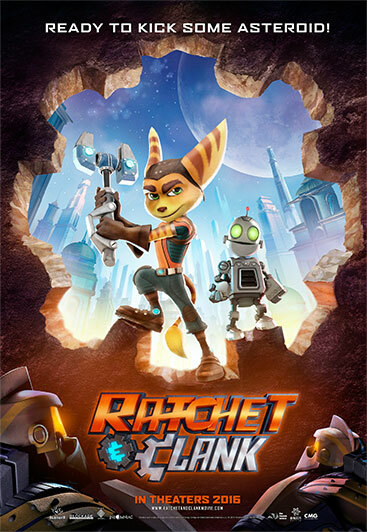 Ratchet & Clank will have an amazing voice cast staring: Paul Giamatti, John Goodman, Bella Thorne, Rosario Dawson, Jim Ward, James Arnold Taylor, David Kaye, Armin Shimerman, and Sylvester Stallone! The movie is directed by Kevin Munroe and written by Kevin Munroe and Gerry Swallow. Get ready for this all new release with these epic sneak peek videos staring Ratchet & Clank!